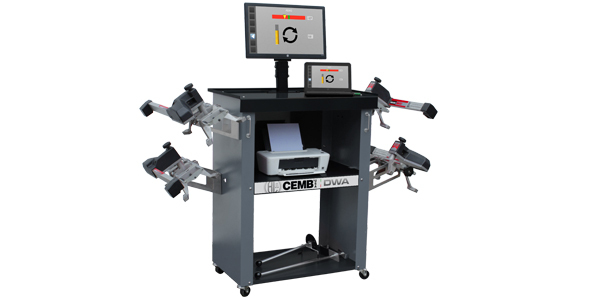 CEMB has introduced a new wheel alignment system designed to maximize labor profits when repairing and calibrating advanced driver-assistance systems (ADAS). ADAS is changing the landscape of the automotive world. Lane departure warning, collision braking systems, auto adaptive cruise control and fully autonomous driving systems are all using ADAS derivatives. ADAS uses numerous cameras, sensors and inputs and can take over the vehicle to correct the steering, braking or accelerator to stay safe on the road. Steering and directional travel of the vehicle is all integral to the rear axle thrust angle of the vehicle. Most vehicle manufacturers require a thrust angle wheel alignment before or during the calibration of ADAS. There is even more wheel alignment opportunity with ADAS windshield replacement. Ignoring this step or using the rear axle centerline may not meet manufacturers’ specifications and even increase shop liability if the process is not completed correctly. The DWA1000ADAS represents the perfect package between mobile wheel alignment capability and ADAS calibration set-up efficiency. After the alignment, the same CCD front axle sensors are placed on the ADAS support panel calibration bar by means of universal adaptors, leaving the rear axle sensors in their standard rear axle mounted location. With a single key-press, the technician is able to quickly and simply position the ADAS panel in respect to the vehicle thrust angle in both perpendicular and centering adjustment preparation. NOTE: Additional adjustments to ADAS calibration panels and processes are required. Always consult the vehicle manufacturer for specific repair information. For more information, visit cemb-usa.com.